Author contributions: Liao GQ and Tai S conceived the study, Liao GQ, Wang H, Zhu GY, Zhu KB, and Lv FX acquired and interpreted the data, Liao GQ, Wang H, and Tai S drafted the manuscript. All authors approved the final version of the paper. AIM: To outline the appropriate diagnostic methods and therapeutic options for acquired bronchobiliary fistula (BBF). METHODS: Literature searches were performed in Medline, EMBASE, PHMC and LWW (January 1980-August 2010) using the following keywords: biliobronchial fistula, bronchobiliary fistula, broncho-biliary fistula, biliary-bronchial fistula, tracheobiliary fistula, hepatobronchial fistula, bronchopleural fistula, and biliptysis. Further articles were identified through cross-referencing. RESULTS: Sixty-eight cases were collected and reviewed. BBF secondary to tumors (32.3%, 22/68), including primary tumors (19.1%, 13/68) and hepatic metastases (13.2%, 9/68), shared the largest proportion of all cases. Biliptysis was found in all patients, and other symptoms were respiratory symptoms, such as irritating cough, fever (36/68) and jaundice (20/68). Half of the patients were treated by less-invasive methods such as endoscopic retrograde biliary drainage. Invasive approaches like surgery were used less frequently (41.7%, 28/67). The outcome was good at the end of the follow-up period in 28 cases (range, 2 wk to 72 mo), and the recovery rate was 87.7% (57/65). CONCLUSION: The clinical diagnosis of BBF can be established by sputum analysis. Careful assessment of this condition is needed before therapeutic procedure. Invasive approaches should be considered only when non-invasive methods failed. Bronchobiliary fistula (BBF) is a rare disorder, first reported by Peacock in 1850. It consists of abnormal interconnection between the biliary tract and bronchial trees. Unlike congenital bronchobiliary fistula, acquired BBF is usually regarded as a consequence of local infection, such as hydatid or amebic disease of the liver, hepatic abscess, trauma, obstruction of biliary tract and neoplasm[1-58]. However, management of this condition can be very difficult and is often associated with a high rate of morbidity and mortality. Up to now, there has been no widely accepted management strategy in this field. We searched the literature to outline the appropriate diagnostic methods and therapeutic options for acquired BBF. Literature searches were performed in Medline, EMBASE, PHMC and LWW (January 1980-August 2010), using the following keywords: biliobronchial fistula,bronchobiliary fistula,biliary-bronchial fistula,tracheobiliary fistula, hepatobronchial fistula, bronchopleural fistula and biliptysis. Two reviewers searched the literature independently in order to identify articles appropriate for inclusion in this review. Further articles were identified through cross-referencing. As a result, 68 cases were collected and reviewed. Case reports and case series associated with acquired BBF and full texts of case reports in English were included. Cases did not provide basic information such as age, gender, primary diseases and etiological, clinical manifestation, therapeutic method, outcome and follow-up duration were excluded. The clinical outcome was defined as cured when clinical symptoms such as biliptysis, fever and jaundice disappeared without use of drainage tube or with closure of the fistula. In addition, an adequate follow-up period (at least 2 mo) was necessary in patients without tumors. Treatment failure was defined as persistence of symptoms, and death due to bronchobiliary fistula or complications from the treatment. A summary of published case reports in recent 30 years concerning acquired BBF is shown in Table 1[1-58]. Sixty-eight cases were retrieved. Information regarding the demographics, clinical data and other variables were not reported in a few cases, thus the denominator varies in the following proportion of cases. Forty-two (61%) of the patients were men. The median age of onset was 48.3 years (range, 14-87 years) (Table 1). Fistula involving both lungs has not been reported so far. Only one case reported by Weis showed that the BBF orifice was opened in the left lung (Figure 1). Table 1 Basic data collected from case reports in the literature published over past 30 years. M: Male; F: Female; ERBD: Endoscopic retrograde biliary drainage; ENBD: Endoscopic nasobiliary drainage; PTCD: Percutaneous transhepatic cholangial drainage; NA: Not applicable/available. COPD: Chronic obstructive pulmonary diseases. Figure 1 Picture reprint from the article of Weis. The arrows show the bronchobiliary fistula involving the left lung. According to the data, BBF secondary to tumors (32.3%, 22/68) including primary tumors (19.1%, 13/68) and hepatic metastases (13.2%, 9/68) shared the largest proportion. Bile duct obstruction (30.8%, 21/68), including biliary stenosis (17.6%, 12/68) and cholangiolithiasis (13.2%, 9/68) took the second position. Although liver tumor or chronic pancreatitis is associated with different degrees of biliary obstruction, it is considered as an independent etiology. Hepatic hydatidosis had been regarded as the most common primary disease in developing countries for a long time, but only 8 (11.7%, 8/68) cases have been reported in recent 30 years. Other causes were trauma (10.2%, 7/68) and chronic pancreatitis (2.9%, 2/68). One case of hepatic abscess, subphrenic abscess, syphilis gummosa and acute cholecystitis each in a suprahepatic gall bladder as other single primary diseases has been respectively reported. 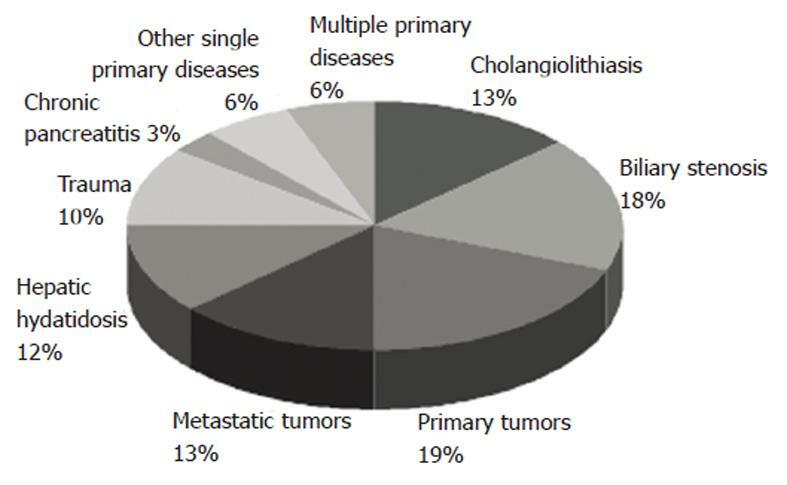 Four cases were complicated with multiple primary diseases in this review (Figure 2). Figure 2 Primary diseases of bronchobiliary fistula. Multiple primary diseases include liver abscess and biliary stenosis, cholangiolithiasis and chronic pancreatitis, metastatic liver tumors and cholangiolithiasis, hepatic abscess and chronic pancreatitis. Biliptysis was presented in all the 68 patients (Figure 3). The volume of scant bile-staining of the sputum and the expectoration of copious volumes of bile ranged from 200 mL to 600 mL and reached a maximum of 1.2 L daily. Respiratory symptoms, such as irritating cough, fever and jaundice, were other clinical features of BBF. 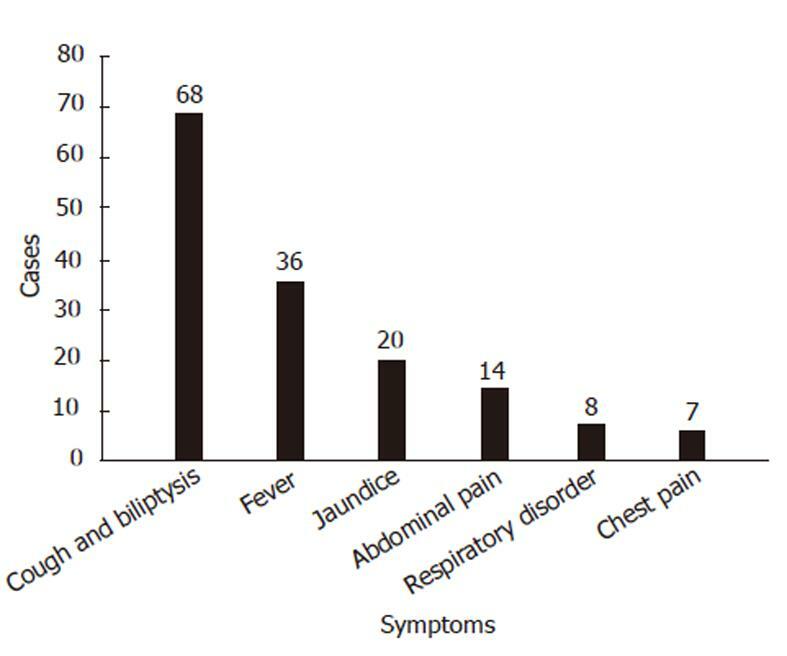 More than half of the patients (36/68) presented with fever. The highest body temperature exceeded 39.0 °C. Abdominal pain was present in 14 patients and most in the right upper quadrant, but chest pain occurred in only eight patients. Respiratory disorders occurred in eight cases, including six cases of dyspneic disease. Symptoms like hepatic decompensation, portal hypertension, anorexia, anemia, nausea, vomiting and diabetes were sporadic. Pneumonia as the most common comorbidity was diagnosed in 10 patients, but bacteriologic results were only provided in two cases. Figure 3 Clinical manifestations of bronchobiliary fistula. Less-invasive procedures had a tendency to be employed in treatment of BBF. Half of the patients underwent therapeutic endoscopy (49.2%, 33/67), including endoscopic retrograde biliary drainage (ERBD) in 24 cases, sphincterotomy in 16 cases, endoscopic nasobiliary drai-nage (ENBD) in 3 cases and endoscopic stone extraction in three cases. Percutaneous drainage was conducted in 5 cases. Percutaneous transhepatic cholangial drainage (PTCD) was used as a main treatment only in two patients. Surgical procedures are invasive, and usually used as a final choice. In this review, 28 patients received open operations (41.7%, 28/67), including pulmonary lobectomy, resection and kposthesis of fistulous tract in diaphragm, hepalobectomy, hepaticoenterostomy and abscess drainage alone or in combination. With the advance of modern medical techniques, histoacryl embolization under bronchoscopic guidance and n-Butyl cyanoacrylate via a bronchial approach brought new insights into this field. However, only one case each by the two techniques was reported by Kim JH and Goldman SY, respectively, and both patients died in the following four months because of hepatic failure or cancer[6,14]. The outcome at the end of follow-up period (range from 2 wk to 72 mo) was good in most of the 28 cases, and the recovery rate was 87.7% (57/65). Therapeutic endoscopy was safer than surgery, as 96.8% (30/31) vs 76.9% (20/26). Intraoperative complications as the cause of death occurred in one patient and recurrent BBF was found in four cases. Among the recurrent cases, one was cured by open surgery, one by percutaneous drainage and the other two cases by ERBD. Local infection has been considered as a classic cause of BBF since Peacock’s report in 1850[1,59]. According to this review, tumor is the major cause of BBF. It should be emphasized that the disease spectrum is changing. It may be correlated with the development of radical surgery and its complications. Primary tumors were all liver cancers in BBF patients as noticed in this review. Among the seven cases with information of tumor location, only two cases had the tumor near diaphragm surface and one case had diaphragm invasion. Metastatic tumors derived from gastrointestinal tract were reported in nine cases of BBF. The pathogenesis of BBF is various. It may involve the iatrogenic damage, diaphragm invasion, intrahepatic or extrahepatic biliary obstruction and tumor cachexia. Although biliary obstruction is the most common pathogeny in literature, its nature is not easy to define, and in most cases, it resulted from the presence of severe inflammation close to the primary lesion or in the hilus of the liver. The obstruction of the bile duct is often due to lithiasis, tumor, hydatid cyst, or postoperative stricture. It should be emphasized that the recent surgery or invasive therapies before biliptysis appearance was observed in 51 cases (75%). And in seven cases, the operation induced the stenosis of bile duct. It is considered that the stress, especially the iatrogenic damage is correlated with bronchobiliary fistula. We also found a congenital case. Therefore, we suspect that congenital fragile structure in diaphragma may be the basic pathogenesis in some cases. Clinical diagnosis is usually made by bileptysis. In some cases, it is inappropriately diagnosed as acute pneumonitis or chronic irritable cough producing greenish sputum. Patients having a long history of biliary tract disease can be diagnosed quite easily. However, some patients exhibited minimal signs of this disease. Sutherland et al described false bile ptyalism in patients with sickle cell diseases and hemolytic crisis. In the patients without these conditions, the presence of bile in the sputum is defined as pathognomonic bronchobiliary fistula. Conventionally, endoscopic retrograde cholangio-pancreatography (ERCP) or percutaneous transhepatic cholangio (PTC) provided direct photographic evidence. This has been the most preferred choice for BBF. But, contrast-enhanced magnetic resonance cholangio (MRC) and hepatobiliary imino-diacetic acid (HIDA) scan not only ensures a definite diagnosis, but also has distinct advantage over other conventional non-invasional techniques[62,63]. In terms of medical treatment, somatostatin and its analogues were often used for treating BBF, because it reduced its secretion in the gastrointestinal tract. But, up till now, not a single case has been completely cured only with medical treatment. Many patients complained that posture had an adverse impact on the volume of biloptysis. But only few doctors considered this factor while treating these patients. Therefore, we suggest that doctors should instruct BBF patients, especially those without biliary obstruction, to refrain from bile postural drainage. In other words, patients should be advised to take orthostatic position and avoid supine position. To alleviate the symptoms and accelerate concrescence of the fistula, bile reflux should be decreased. In addition, electrolyte disturbances and digestive system disturbances occurred when a significant amount of bile is lost. Therefore, supporting therapy should be administered with appropriate prophylactic attention. Recently, when resolution of a distal biliary obstruction was accomplished, non-surgical interventions via ERCP or PTC were successfully conducted. ERBD be-came much more prevalent. It was considered in more than 60% (24/39) of cases for non-surgical treatment in this review. Based on this review, its single application recovery rate is also much higher than traditional surgery (95.8%:76.9%). Although PTCD and ENBD may lead to severe electrolyte disturbances and disturbances of the digestive system triggered by bile loss, it is convenient to recheck the healing of fistula using the radiographic technique with contrast media injection via drainage tube. This is practically more advantageous for managing the disease. In the past few years, histoacryl embolization under bronchoscopic guidance or the n-Butyl Cyanoacrylate via a bronchial approach were reported as new therapeutic methods[6,14]. However, these methods should be proved by more clinical cases. The open surgery should be the first choice when interventional techniques have failed or BBF secondary to tumors, biliary obstruction and trauma occurred. The type of operation depends on the primary tumor type, BBF location and involvement. The following surgical procedures were performed in BBF: drainage of right subphrenic or hepatic abscess, closure of fistula, resection of hydatid cystis or tumor, biliary drainage using T-tube, and bilioenteric anastomoses (e.g., Roux-en-Y hepaticojejunostomy). In case of diaphragmatic, pleural, bronchial, or pulmonary damages, closure of the diaphragm, pleural drainage, decortication or different pulmonary resections have been used. Gugenheim et al recommended a two-stage approach for treating BBF: (1) external biliary drainage by percutaneous or surgical drainage of subphrenic abscess and/or direct percutaneous drainage of the intrahepatic biliary tract; and (2) treatment of the underlying cause. In the patients with biliary obstruction, the priority management was to treat the biliary disease. Early diagnosis and treatment can alleviate the patient’ s sufferings. But there has been no evidence as to whether they can improve the prognosis of these patients. We have not obtained any information about the prevention of this disease. In conclusion, we reviewed limited information of BBF published in the past 30 years. We could not completely understand its etiology and pathogenesis. The published experience suggests that ERCP or PTCD should be a priority. But new diagnostic techniques such as contrast-enhanced MRC and HIDA scan have greater advantages. While considering the medical treatment, quite a few doctors have advocated non-operative therapy as the preferred choice. Individualized and multi-disciplinary treatment should be emphasized in patients with primary diseases as the condition of each individual patient is quite different and complex. Bronchobiliary fistula (BBF) is an uncommon disorder involving biliary channels and the bronchial tree. Acquired BBF without proper management can induce death. With the improvement of non-invasive approaches, more satisfying outcome can be expected. Increasing non-invasive and less-invasive approaches to the management of acquired BBF can offer promising benefits to the patients with this condition. In this literature review, the authors point out that the definite procedure such as surgery should be considered only when the non-invasive methods failed. Invasive procedure such as surgical excision of the fistula has been used widely, while less-invasive methods like external and internal stenting which can reduce biliary obstruction are of more value, since they are much safer and easier. The authors of this review searched the literature, provided more diagnostic and therapeutic options in management of acquired BBF. BBF is rare and easily misdiagnosed as respiratory disease. Patients with this disease usually had poor outcome. However, there has been no guideline in BBF treatment up to date. This study reviewed the management strategy of BBF and summarized the experience from literatures in the past 30 years. It may contribute to the clinical treatment of BBF. Hepatobiliary imino-diacetic acid scan is a nuclear imaging procedure to evaluate the status of the gallbladder. N-Butyl cyanoacrylate is a tissue adhesive that applied as a monomer to moist tissue and polymerizes to form a bond. It is biodegradable slowly and used in all kinds of surgeries. This paper is a review of the world literature regarding BBF. Authors presented a spectrum of case reports concerning BBF. Idea of the summary about the knowledge of BBF is interesting.